Address: 422537 Republic Tatarstan, Zelenodolsky r-n., p/o Raifa, pos. Sadovy. Zapovednik Volzhsko-Kamsky is situated in the eastern part of the Tatar Republic. The Zapovtdnik was founded in 1960, its area is 8 thousand ha. It consists of two parts: Raifsky (3,9 thousand ha) and Saralovsky (4,2 thousand ha) with Kuibyshevskoye water reservoir (1,3 thousand ha). 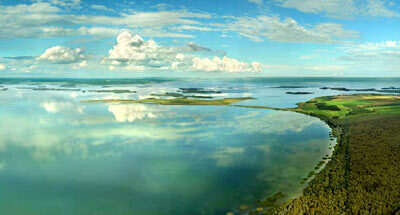 The Zapovednik is situated on the left bank terraces of the river Volga. More than 90% of the area is covered with forests. In the Raifsky part spruce-fir forests, different types of pine forests, oak woods, mixed forests, lime forests, birch forests, aspen forests, and inundated alder forests are spread. Hoods with pines, spruces and oaks 200-300 years old remain. Bogs are diverse, mostly intermediary ones. Since 1921 there exists in the Zapovednik an arboretum, where European, Asiatic and North-American trees and bushes grow. Some of them have spread into the forest areas of the Zapovednik. 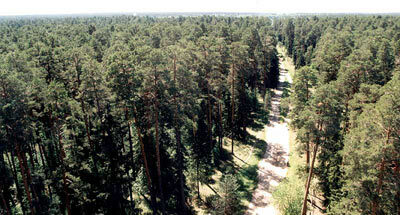 In the Saralovsky section pine and lime forests prevail. On sandy hills and the steps of terraces there grow light steppe pine forests, and steppe plant communities with various herbs and grasses are met. 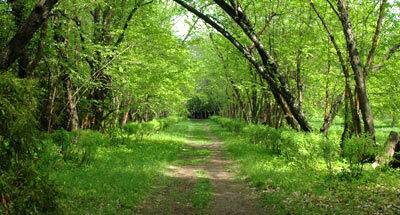 There can be found 344 vascular plant species, including 51 species of trees and bushes. There can be met several rare species, included in the Red Data Book of the Russian Federation — Cephalanthera rubra, Lilium martagon, yellow lady’ s slipper, etc. In the animal world there are to be seen taiga, oak wood and steppe animals. Mammals make up 55 species which include elk; roe, wild boar, fox, marten, Mustela eversmanni, badger, alpine and European hare, and Citellus major; wolf are rare; lynx are sometimes visitors. There are additionally acclimatized raccoon dogs, muskrats, and American mink. Birds make a total of about 200 species, including wood grouse, hazel grouse, partridge, Coturnix coturnix, common heron, and crane. 8 bird species are rare and disappearing (the white-tailed eagle, fish hawk, black stork, etc. ); so also are one species of wing-handed animal (giant noctule), 2 bee species, 1 hymenoptera species, and 7 butterfly species. 30 fish species are noted: sterlet, sabrefish, zander, etc.